Risher Mortuary was great and there for me every step of the way. They were great at answering questions and giving me all of the information I needed and taking care of all of the details that I didn't know about. In not knowing how to handle any of this, they were very supportive, helpful and patient in helping me through this difficult time. Great an friendly very helpful they go the extra mile for you very happy whit ther services. Thank you so much for your support and patience during this difficult event. Our mom died at home, under Hospice. We called the Hospice, who called Risher, who asked when we wanted my mom picked up. We asked for 6 hours for family to gather and that was fine with them. When they came, you would have thought it was a military event. The 2 staff who came were incredibly respectful and unhurried. It was ceremonial the way they took my mom out of her house. I was surprised at how touching the process was. I feel that Risher Mortuary deserves more than just these 5 stars. The staff here at Risher is extraordinary are awesome. It's comforting from the time you walk through the door and it goes unrecognized the amount of work they put into meeting your needs. They all have a huge heart at their establishment and it is displayed through their understanding, hospitality, and compassion. All of you guys made one of the hardest times for my family go so smoothly and did not force our hand on anything we did not want. We cannot express how grateful we are to have found this mortuary. Also, the work you guys did on my Brother was AMAZING!!!!! My entire family was beyond shocked at how well you guys did and we love the service we received. 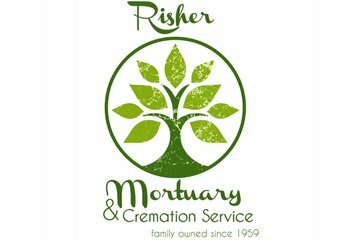 Special thank you to Nacy and to Joe for further extending Risher Mortuary Services to myself and my family during our time of grief, I thank you for letting us know you guys are still there for us even after the service. They are sensitive to your needs in these difficult times. We were very pleased with the kindness Nancy and Risher's staff showed us. Some of the most caring and sensitive people I have ever had the pleasure of meeting. During such a hard time in my life, the death of my younger brother, they were there for my family. She walked us through the process with the utmost care, compassion, and respect. She made sure everything was under control and it was. Very accommodating and helpful. Made the process a lot easier. Great staff. We have used this mortuary twice now. They are amazing, caring people. Many, many thanks to Brittany for all her help with my ex-husband's funeral services. Brittany was kind and help my son and I tremendously. I never thought after being divorced for 23 years I would be left planning my ex-husband's funeral. But she made this process very easy for my son and myself. I would so highly recommend this mortuary for a beautiful funeral service. My son's father was in the United States Marine Corp and the arrangements that we made were perfect and beautiful. I hope that he is proud of his son and I. My brother and I were very pleased with all the staff and services provided by Risher. Everything from leading up to the wake, the wake services and funeral procession were all handled professionally. Professional, courteous, considerate and accommodating. Extremely thankful for your wonderful service on both my Father Hector Perez Mojica and my grandfather Alfredo G. Soto .. thank you all so much from everyone in our family we thank you..
everyone that's works there treat you like family...I recommend them to anyone looking for a funeral home....5 stars all the way. Britney and the team provided great customer service during and after the services. Greatly appreciate all the help during these difficult times. We had no service for Brent, but Brittany was so caring and compassionate with all of my questions and needs. Thank you for your kindness and professionalism..... I couldn't have asked for anything more - It's so nice to see there are still family owned businesses that exist and treat their clients with personal attention. Again, thank you. My mom and I were highly satisfied with your professional and courteous help through the whole process of my Nana's arrangements. All of your staff were very accommodating and nice to us during this difficult time and we will never forget that. Risher handled the funeral arrangements with such care and dignity I was extremely happy and comfortable with them. I highly recommend them during you’re time of need. It is with much appreciation and gratitude that I whole heartedly thank Barbara Risher Welch and her entire staff. The staff at Risher were amazing. They were so helpful starting from the 1st day I had to go in to make arrangements, to the day of the Services. I could not ask for better service. Thanks again for everything you did.